There are so many wonderful places to visit in the Loire Valley that newcomers to the region often need guidance. It’s pointless saying “Chenonceau is my favourite. You should go there” or “Forget about Chambord, there’s nothing to see”. Each of the châteaux is different and visitors will be attracted to one or the other according to their own individual tastes. My aim here is to give an idea of what each has to offer so you can make your own choice. I only intend to talk about the “pleasure castles” here, and not fortified castles such as Chinon and Loches, or religious edifices such as Fontevraud l’Abbaye, or mansions such as Clos Lucé. I’ll start with the four “Cs”: Chenonceau, Chambord, Cheverny, Chaumont, followed by the royal castles of Amboise and Blois, all of which are located in the same general area, then Azay le Rideau, Ussé, and Villandry, which form another geographical group, with Valençay off on its own to the south. You can see more photos and further detail about each château by clicking on the corresponding name. The rooftops of Château de Chambord, along with its famous double staircase, are its best known features and must be one of the most stunning examples of architecture I’ve ever seen. François I, the star of the French Renaissance, was only 25 when he commissioned the château in 1519. Unfortunately, despite the presence of 2000 workmen, it wasn’t completed in his lifetime and he only stayed there for 72 days out of his 32 years on the throne! He used it as a hunting lodge of course and it was not furnished – he used to travel around with everything and everyone he could possibly need. But his son, Henri II, as well as Louis XIV, who also loved hunting, turned it into the château we know today. There is a series of furnished rooms in one wing that can be visited as well. In the mid-nineteenth century, the Count of Chambord decided to open the château to the public and furnish some of the apartments with his own private collection, mainly consisting of royal portraits and other rather disparate pieces of furniture. On 1st May every year, there is a wonderful antique and second-hand fair in the extensive castle grounds that is certainly worth attending. There are several restaurants and souvenir shops in view of the château. Open all year except 1st January, 31st January, 25th December. From 20/01 to 31/03 and 01/10 to 31/12: 10 am to 5 pm; 01/04 to 30/09: 9 am to 6 pm. 11 euros. Château de Chaumont stands in a prize position overlooking the Loire and is best seen from the other side of the river. From April to October, it hosts a wonderful garden festival with a different theme each year. The château as it stands today was rebuilt from 1468 to 1511. It was bought by Catherine de Medicis, wife of Henri II (son of François I) in 1550. 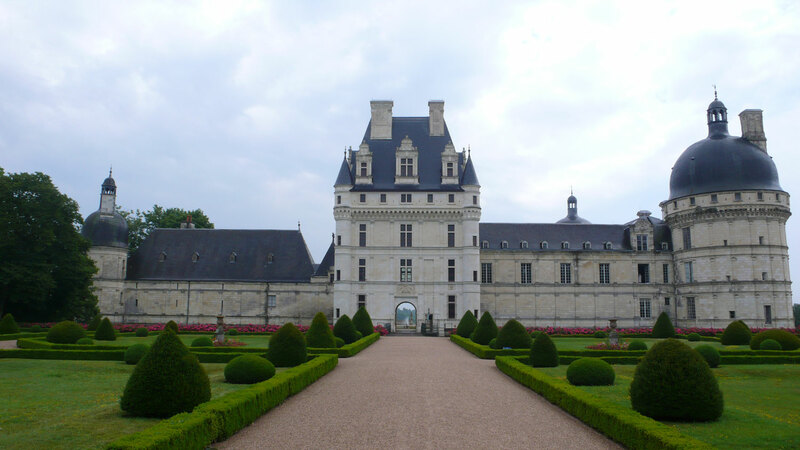 On his death, she forced her husband’s paramour, Diane de Poitiers, to swap Chenonceau, a gift from Henri, for Chaumont. The château was later restored by Prince de Broglie between 1875 and 1900, including the beautifully furnished state rooms and luxury stables with their exercise ring. 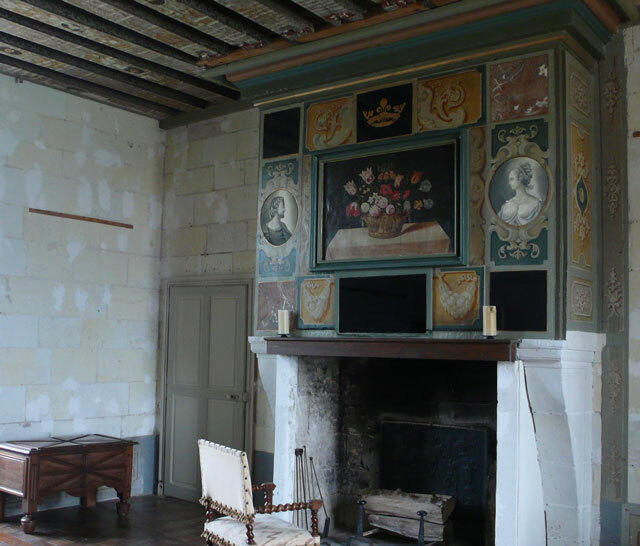 The top floor of the château, currently in a somewhat derelict state, can also be visited, as well as the basement kitchens. Between the château, the stables, the grounds and the garden exhibition, you can easily spend the day on the Domain, which has no fewer than four different restaurants. Open all year round, from 10 am to 4.30, 5.30 or 6.30 depending on the season. 10 euro for the château, park and stables, and 16 euros if you include the garden festival. If you want to combine your visit to Chaumont with a gastronomic experience in one of the finest restaurants in the region. 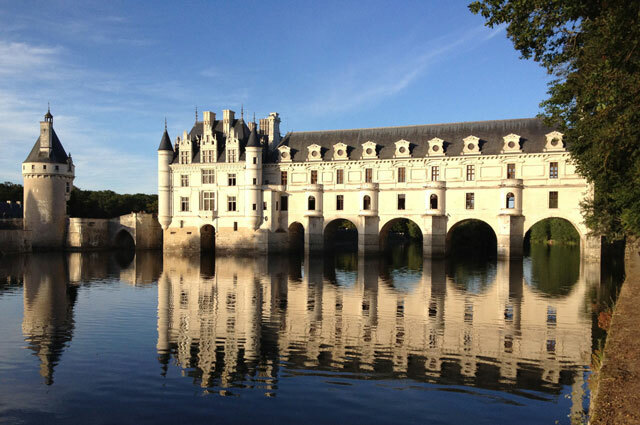 Built from 1513 to 1521 and celebrating 500 years of existence this year, Château de Chenonceau spans the Cher River. It’s a ladies’ castle, built in 1513 by Katherine Briçonnet, decorated by Diane de Poitiers, extended by Catherine de Médicis and saved by Louise Dupin during the French Revolution! All four are featured in a wax museum in a separate building. 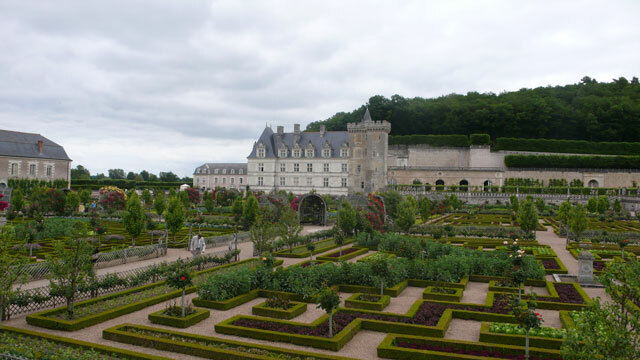 The château should be viewed from all sides, so you should allow time to walk around the grounds themselves, which include Diane’s and Catherine’s gardens, a vegetable garden and a labyrinth. You can also walk (or cycle) along the south bank of the Cher River or hire a rowing boat in summer. The sumptuous inside is completely furnished with several masterpieces and includes a visit of the basement kitchens. 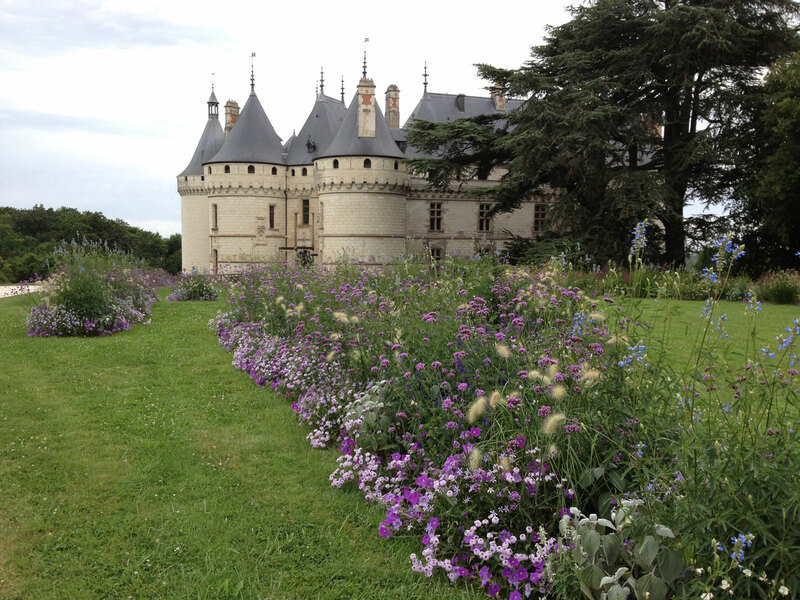 A free iPhone app (Découvrir Chenonceau) offers an introductory visit in 11 languages! You can taste the château’s own wine in one of the restaurants inside the grounds. Every weekend in June and every evening in July and August, the gardens are illuminated at night. Open all year round, 9 or 9.30 am to 5 to 8 pm, depending on the season. 11 euros for the château and grounds, 13 euros including the wax museum, plus 2 euros for an audioguide. 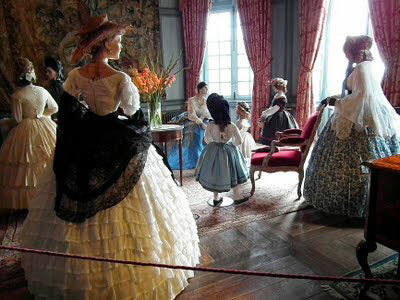 Château de Cheverny is another experience altogether. The domain has been in the same family for more than six centuries and open to the public since 1922. The château as we know it today was built between 1624 and 1640 by Count Henri Hurault and his wife Marguerite Gaillard de la Marinière. 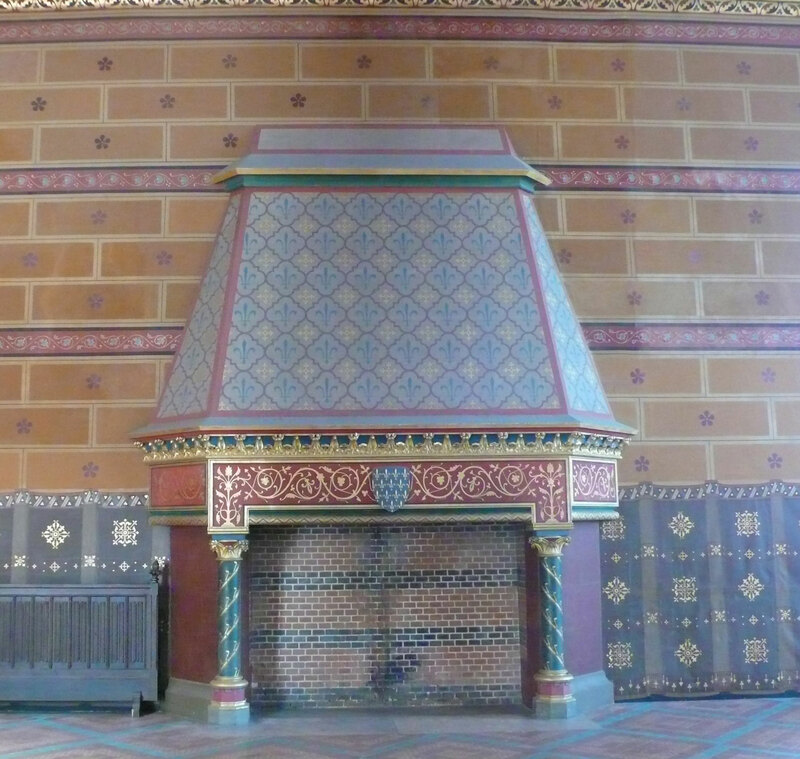 The sumptuous interior decoration is by Jean Monier from Blois. 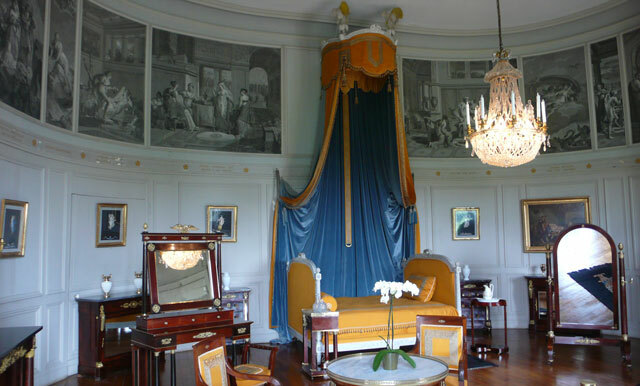 It is the only major château to have retained its original furniture and furnishings. Fifteen thousand bulbs are planted in the gardens each year, so if you can, time your visit for spring! Cheverny has two other attractions. The feeding of its 100 hunting dogs is very popular with visitors during the summer (although the kennels are currently closed for refurbishment) and there is a Tin Tin exhibition – Cheverny was used as a model by Hergé for Marlinspike Hall, Captain Haddock’s residence in the Tin Tin comic books. Just next to the château is the Maison des vins de Cheverny et Cour-Cheverny, where you can taste and buy the local wines. Open all year round. 9.15 to 9.45 am to 5 pm to 18.45 pm depending on the season. The dogs are fed from 1/04 to 15/09 every day at 5 pm and from 01/01 to 31/03 and 16/09 to 31/12 at 3 pm on Tuesdays, Wednesday, Thursdays and Fridays. 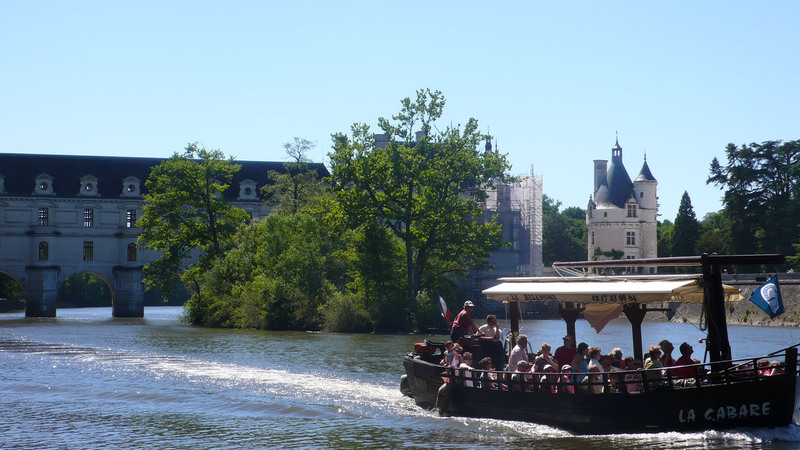 Château and gardens, 9 euro, with Marlinspike museum 13.50 euro, with boat and electric car trips 14.70 euro, plus Marlinskpike 19.20 euro. 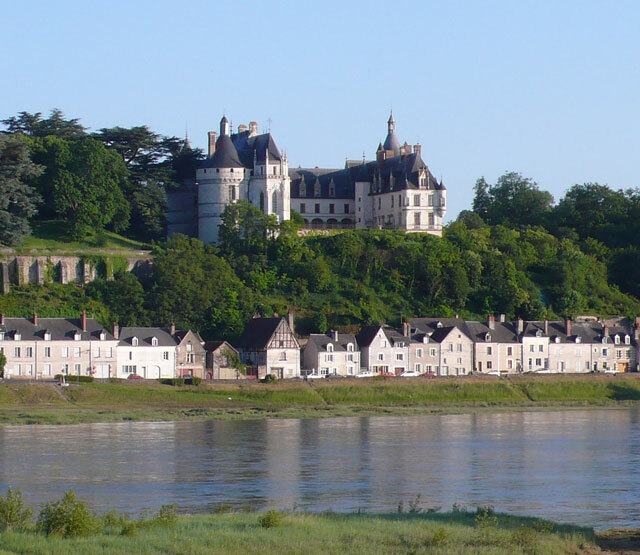 The Royal Château of Amboise stands in a stunning position overlooking the Loire, best seen from the little island called l’Ile d’Or in the middle of the river. It became a royal residence in the mid-14th century and was a favourite with many French kings, from Louis XI to François I. 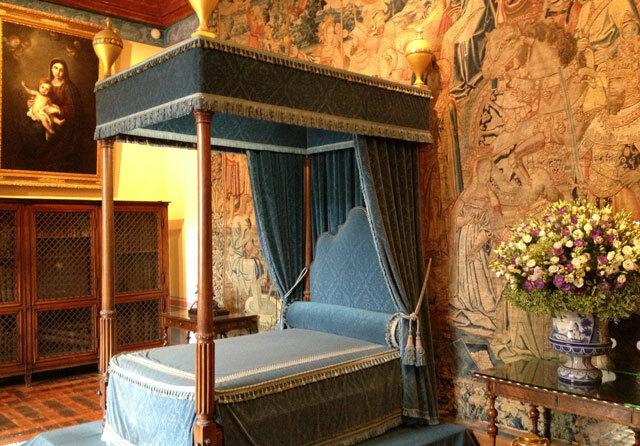 It has an exceptional collection of Gothic and Renaissance furniture. 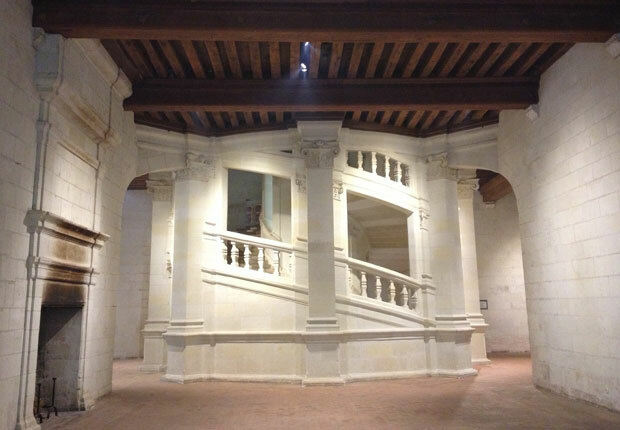 An unusual feature is a wide ramp inside the château used directly by horses and carriages. Saint Hubert’s chapel is thought to be the last resting place of Leonardo da Vinci whose home in Amboise, Le Clos Lucé, contains scale models of many of his inventions. The beautiful panoramic gardens afford wonderful views of the Loire, the old town with its half-timbered houses and the surrounding countryside. The very extensive Friday and Sunday morning market along the river is one of the best in the area. Open all year round from 9 am to 12.30 pm and 2 pm to 4.45 pm from 15/11 to 28/02 and from 9 am to 5.30 to 7 pm from 1st March to 15th November. 10.50 euro + 4 euro for audioguide. 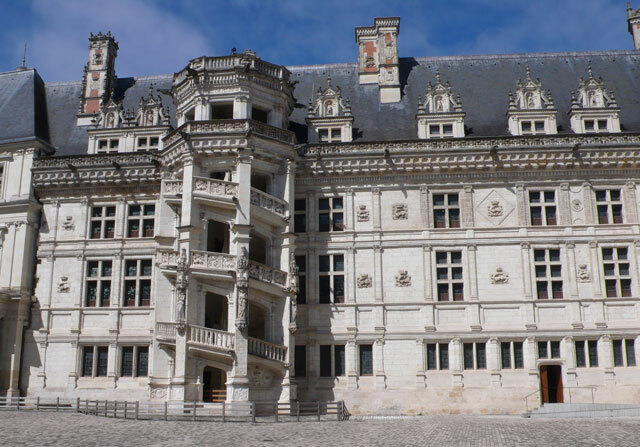 Like Amboise, the Royal Château of Blois is built on a promontory right in the middle of the town overlooking the Loire River, and encompasses several different architectural styles from mediaeval times to the 17th century. At the end of the 14th century, the château was bought by the Orleans family and nearly a century later, Duc Louis d’Orleans became Louis XII and brought his wife, Anne de Bretagne, and his court to Blois. They modernised it all, so to speak, with stairs at each end and balconies on the first floor, decorating it with their emblems, the porcupine for Louis and the ermine for Anne. François I, whose salamander is a recurring theme, lived in the château after he ascended to the throne in 1515. The Duc de Guise was assassinated in the King’s Chambers on the orders of Henri III in 1588 after plotting to take over the throne and Catherine de Medicis, wife of Henri II (son of François I) and mother of Henri III, died there the next year at the age of 70. 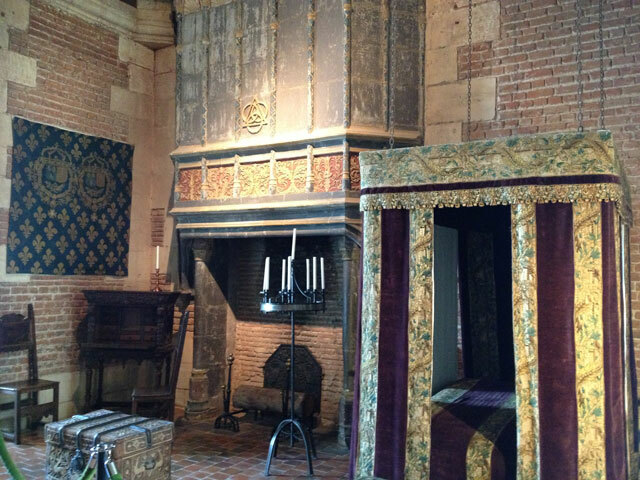 The interior is extremely rich and colourful with many fine fireplaces and majestic pieces of Renaissance furniture. There is also a lapidary section with gargoyles, statues, pediments and other bits and pieces taken from buildings on the site. There is a sound and light show in the summer. Open all year round from 9 am to 12.30 pm and 1.30 to 5.30 pm in the winter months and 9 am to 6 or 7 pm from 01/04 to 31/10. Sound and light show at 10 or 10.30 pm. Château 9.50 euro; château + sound and light show 14.50 euro; sound and light show 7.50 euro. 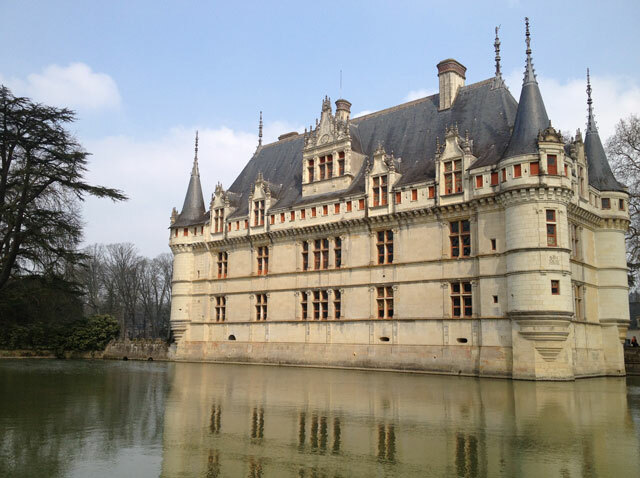 Considered by many to be a “jewel of the French Renaissance”, Château d’Azay le Rideau was built on an island in the Indre River by a rich financier in the early 16th century during the reign of François I and combines the Italianate and French styles. 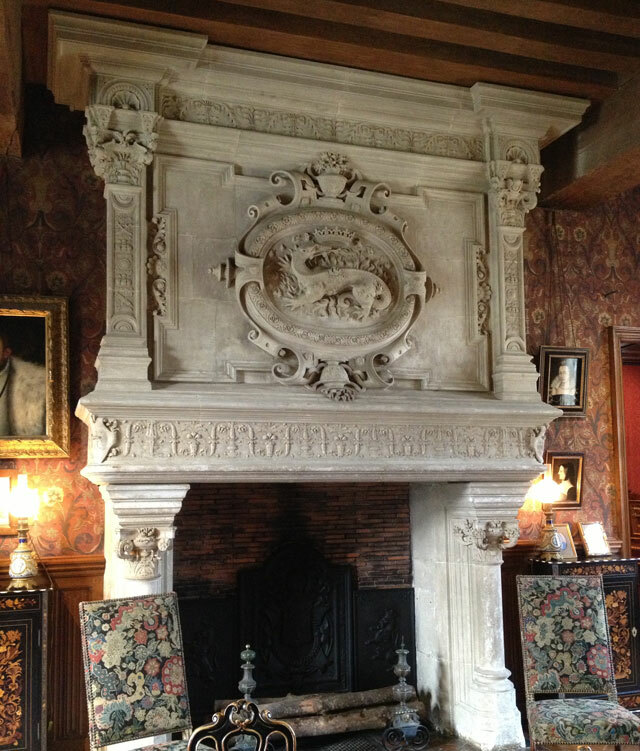 It is more sober than the larger châteaux and one of its most striking features is its monumental fireplaces. The château was abandoned after the French revolution and redecorated by the Marquis de Biencourt. In 1898, the 4th Marquis had to sell out and it was not until it was bought by the State in 1905 that renovation began. 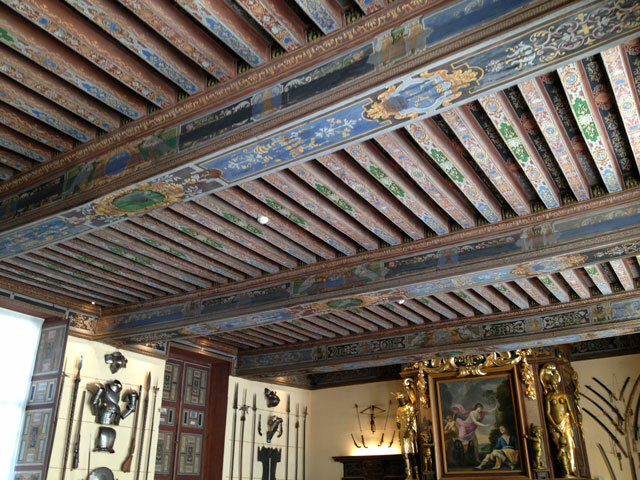 Now most of the rooms are decorated in the 19th century neo-Renaissance style, but the royal apartments still have some older pieces. 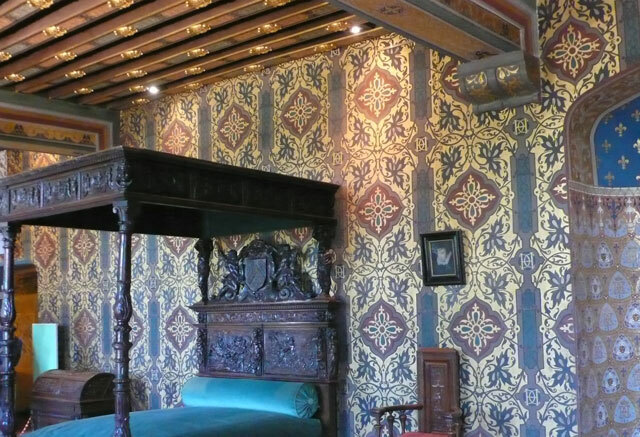 A wonderfully reconstructed Renaissance bedroom with copies of authentic soft furnishings and rush-matting on the walls is accompanied by a very instructive video. The roof space, opened a couple of years ago after major restoration, is the most remarkable example of Renaissance master carpentry now on show. The natural moat forms two “mirrors of water” reflecting the ornately sculpted frontons and pointed roofs of the château. The lovely jardin à l’anglaise or landscaped garden is the perfect place to wander on a fine day and affords stunning views of the château. Open all year round. Every day from 10 am to 5.15 from October to March, from 9.30 to 6 pm in April, May, June and September, from 9.30 t 7 pm in July and August. Closed 1st January, 1st May, 25th December. 8.50 euro + 4.50 for an audioguide. Le Lavoir in the castle grounds and a large choice of restaurants in the town itself. Known as “Sleeping Beauty’s castle” because it was one of the châteaux that inspired Walt Disney, Château d’Ussé overlooks the Indre River. Cycling towards it in summer with sunflower fields on either side is an unforgettable experience. The original 11th century castle has been rebuilt several times, which explains its 16th-17th century aspect today. 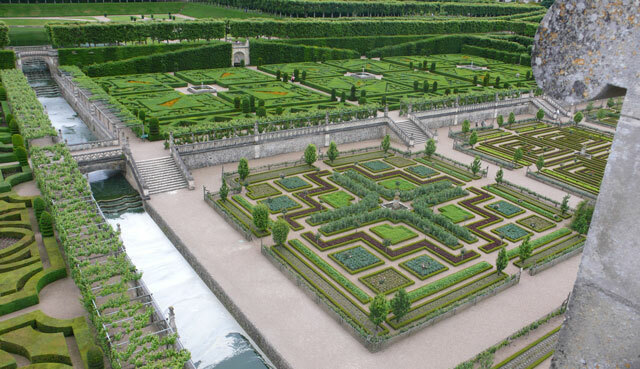 The grounds were redesigned in the 17th century by André le Notre, Louis IV’s landscape architect, who masterminded the gardens of Versailles. Inside, monumental fireplaces and beautiful 18th century furniture and tapestries offer a backdrop to a life-like exhibition of mannequins in period costume which changes each year. 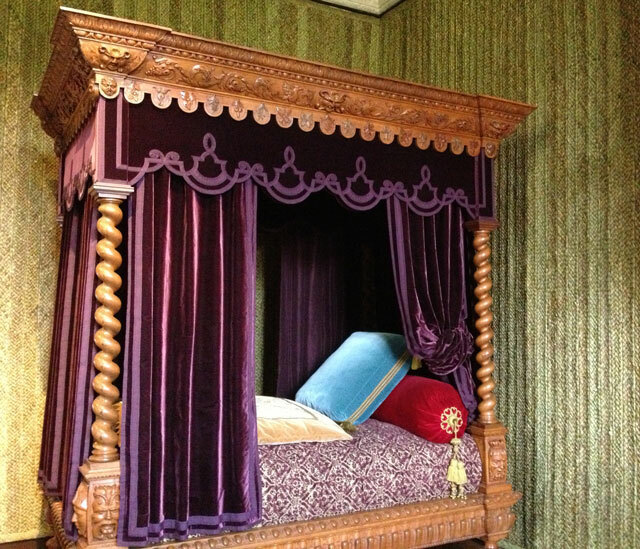 The parapet walk offers access to rooms containing scenes from Sleeping Beauty and everyday life in the 19th century. A lovely Renaissance chapel stands outside the château. Open from mid-February to mid-November, 10 am to 6 pm 17/02 to 31/03 and 1/09 to 11/11, and 10 am t 7 pm 01/04 to 31/08. 14 euros. Valençay, rebuilt in 1520 by Jacques 1er d’Estampes and extended in the 17th and 18th centuries, was bought by Talleyrand in the 19th century at the instigation of Napoleon to welcome foreign dignitaries. Its sumptuous Italian arcaded gallery makes it a reference in the field of Renaissance architecture while its domed towers, dormer windows and bull’s eyes are perfect examples of the neo-classical style. The inside is furnished just as it was during Talleyrand’s time, with elaborately embroidered Empire chairs, ornate tables and sumptuous chandeliers. Magnificent vaulted cellars house the kitchen, pantry and cellar in which one of the best tables of Europe was prepared. The château is surrounded by a lovely formal garden and a landscape garden. Two nights each summer, the château is illuminated with 3,000 candles, and costumed actors and trumpeters revive the imperial celebrations of the past. Open all year round. Every day from 16/03 to 11/11 from 9.30 to 10.30 am to 5.30 to 7 pm. 12 euros. Also built overlooking the Loire, Château de Villandry is a château for garden lovers and the last of the major Renaissance castles to be built in the Loire Valley. It was the home of neither a king nor a courtesan but of Jean Le Breton, François I’s finance minister. He demolished the old feudal fortress, except for the keep, in 1532 and replaced it with an extremely elegant and richly decorated purely French Renaissance château. 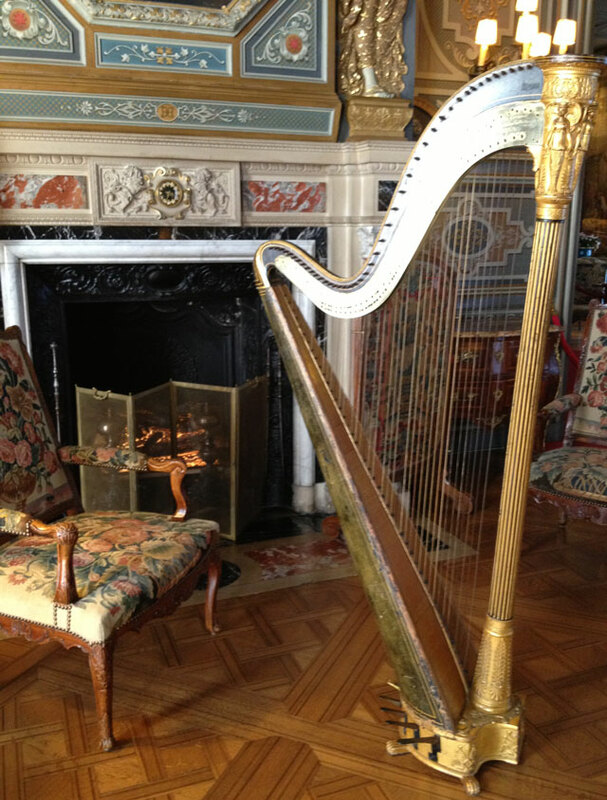 When the Marquis of Castellane bought it in 1754, he revamped the interior in the neo-Classical style. Unfortunately, he also destroyed the harmony of the outside, adding balconies, balustrades and trompe l’œil windows. The gardens were much more successfully refurbished in the early 20th century to recreate the ambiance of a Renaissance garden. An arbour of grape vines leads to a large parterre, designed as a Garden of Music. The Garden of Love is on the other side of the canal. The garden combines flowers and vegetables and its true glory can best be experienced from the top of the château. A shop sells seeds and plants and other garden-related items. Open all year round. The gardens are open every day from 9 am to 5 pm to 7.30 pm depending on the season. The castle is open from 9 am to 9.30 am to 4.30 to 6.30 pm from 16/02 t 11/11 and during the Christmas holidays. 9.50 euro, gardens only 6.50 euro. And if you’re looking for an exceptional place to stay in a central location, why not check out our rental accommodation for 2 to 4 people in Blois – Closerie Falaiseau, an historical cottage built in 1584! Click here for more information. This entry was posted in Architecture, France, Loire Valley, Loire Valley châteaux and tagged Amboise, Azay-le-Rideau, Blois, Chambord, Chaumont, Chenonceau, cheverny, Ussé, Valençay, Villandry. Bookmark the permalink. The photo of Chenonceau reflected in the river is really lovely. A great overview of the chateaux. Thank you. I love that photo too. The light was just perfect that day as we rode along the river bank opposite the château. I thought Ussé was known as Sleeping Beauty’s castle primarily because it inspired Perrault, rather than Walt Disney (although perhaps him too). Hello Gwan. Yes, you’re perfectly right. Perrault stayed at Ussé several times in the early 1700s. My information was not complete. 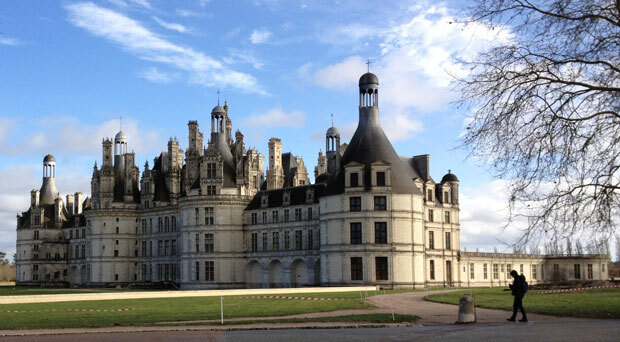 What a wonderful write up on the Chateaux of Loire Valley. There are so many here and one is spoilt for choice but your write up was great, and help your readers narrow down which one to visit. Great photos too!! Thank you so much! I’m working on a second series of lesser known châteaux now. Azay le Rideau is one of my favourites too. I imagine how romantic it must have been to wake up to it in the morning! This is such a great round-up of the main castles to visit and I’m ashamed to say I’ve only been to one! I’ve driven through the area many times and have been to a few weddings near by with the intention of visiting a castle on the Sunday, but somehow it’s never happened. So I’ve only been to Villandry which I loved and MUST get to some more soon. Thanks for linking up with #AllAbout France Rosemary, this is an excellent post for my linky. One castle out of ten! You’ll have to improve your score – and come and visit me. 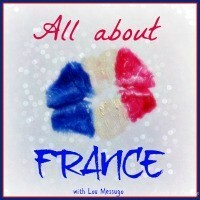 #AllAbout France is a great link-up and I’m sure readers are going to appreciate it. What a great post! My husband and I toured the Loire valley about 15 years ago and saw most of these. It was a wonderful trip and we’ve been talking about doing it again. I’ll definitely refer back to this post for guidance when we are ready to go. Thanks for sharing this! And when you do, Margo, I hope you’ll let me know so we can meet up! 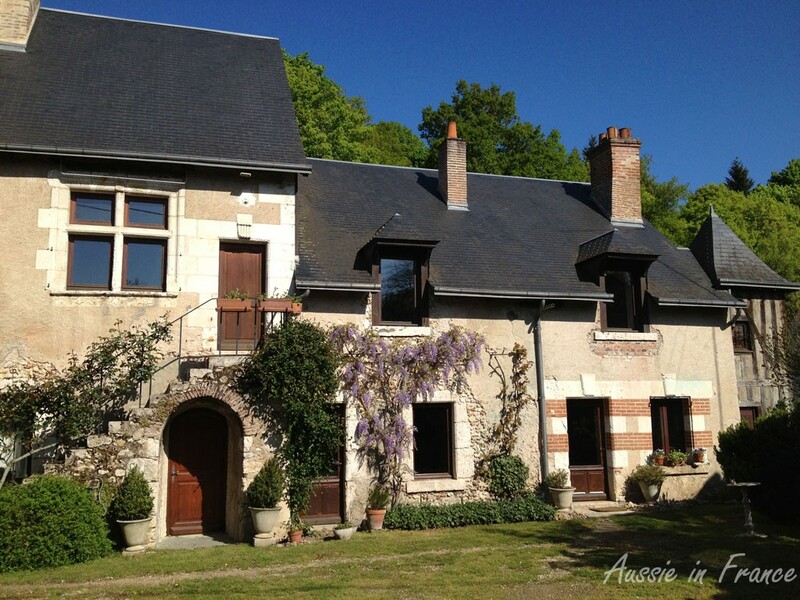 This is such a wonderful round-up of chateaux in the Loire! 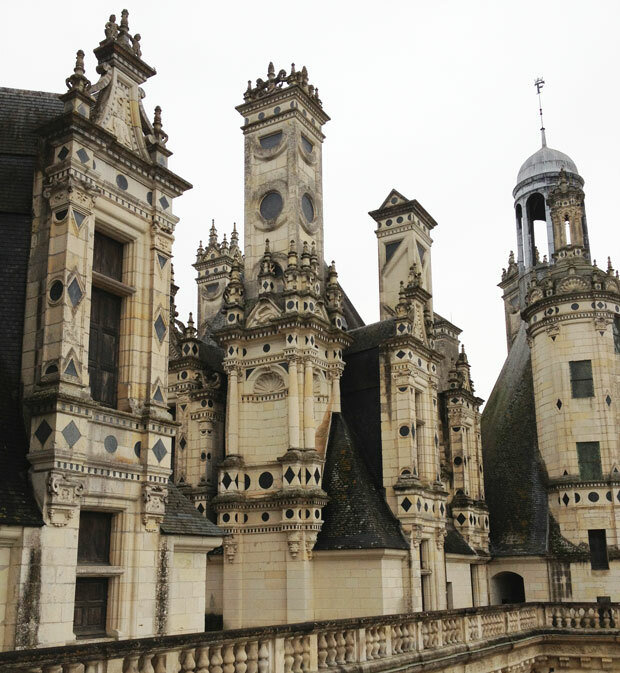 I’ve been to all but Valençay and Ussé (didn’t realize it inspired Sleeping Beauty’s castle! ), and you are right – each one is unique in its own way. I love the elegance of Chenonceau sweeping over the river and the sheer massiveness of Chambord. 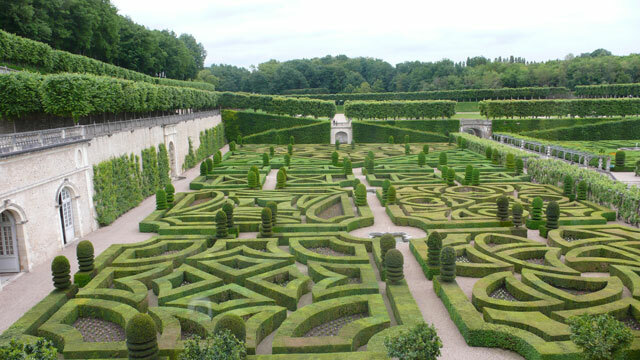 And although I never went into the chateau of Villandry, its gardens are absolutely beautiful. They are so diverse and you are right – each offers something different. It amazes me just how many there are in the Loire Valley alone to see! Thank you Sara. You’ve done pretty well with 8! And, as you say, there are lots more to come! Montpoupon is another of my favourites. That sounds like my first trip to Spain. Travelling on a shoe string doesn’t always make for the best visits! I was so pleased to find your blog and this article (along with many others). My family and I are travelling from Australia to the Loire Valley and Paris this year so you have provided some wonderful information! Hello Nathalie, and welcome to Aussie in France. I do hope you enjoy your trip to the Loire Valley and Paris. 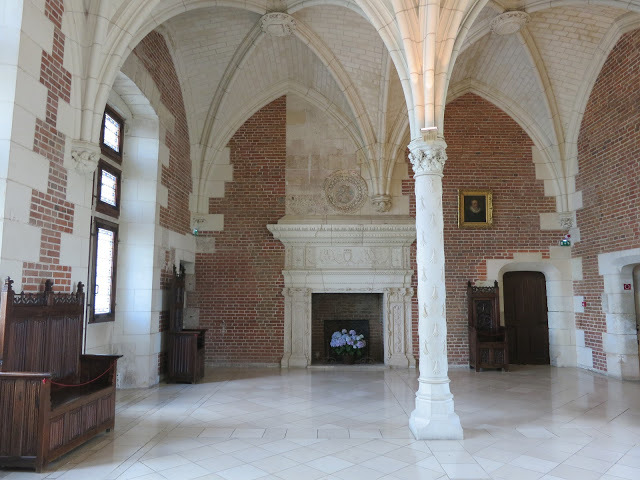 Tomorrow, I’m publishing a second post on 4 lesser known chateaux. Hi Rosemary! Love this post! 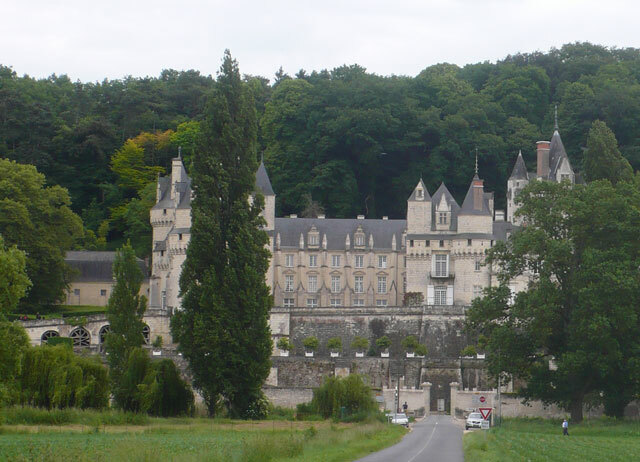 We did a Loire Valley road trip for Christmas 2013, and hit about half of these chateau. We didn’t have a ton of time, so we skipped several of the interiors, but we like to say that we’re saving them for later! The exteriors are so incredible and overwhelming, that it was really enough for us the first time around. We’re excited to go back someday and really invest in some of our favorites from before and some new ones as well! Thanks for this list of 10, and the beautiful photos! Hi Christy, glad you enjoyed it. There are so many qhâteaux (and you’ll find another 4 in my post tomorrow) that you need to come back several times. Thanks for the link to “Chateaux Hopper Passes”. Our own walls are 70 centimetres thick (the house is 400 years old) and we have a beautiful Renaissance fireplace we renovated a few years ago. You might like to have a look at http://www.closeriefalaiseau.com. It’s very special to live in such an historical home even though it was only a bourgeois dwelling. 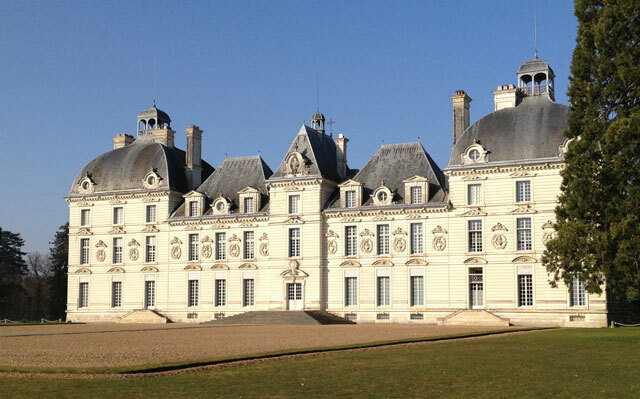 Loire Valley is such a landmark with its various, elegant and authentic castles. Each time I read about it I get more tempted to make the trip and this time is no exception. Rejoicing about the idea of a castle tour, that would be fantastic! Thank you, Frederic, we love the area we’ve chosen to live in and Blois is ideally situated :).